These full-color custom mouse pads were designed for Gemcom, Inc. to develop brand awareness and encourage their clients to utilize their updated online store, which we also designed! These measure 6″x8″ and feature a firm surface with a non-skid rubber base. 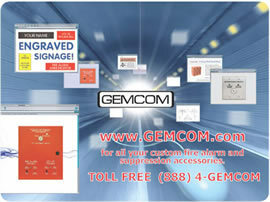 The full-color design incorporated the many products Gemcom offers which included custom fire annunciator parts, custom switches, and engraved signage. Working with the leading supplier of custom writing utensils in the world, Bic Graphic USA, dream ink is always confident we are providing the highest quality custom products to our clients. While there are many suppliers of custom mouse pads, Bic Graphic has done a great job for us in always delivering on-time to exceed expectations. Computers and mouse pads have become part consumer’s everyday life. Whether you are looking to build your online brand or promote a new website, custom mouse pads are a perfect promotional tool. Find over 800 styles of customizable mouse pads with our intuitive search tool by clicking here or call today for a free quote!